Pacific Lutheran College is a coeducational Kindergarten to Year 12 independent private school of the Lutheran Church of Australia, serving the Caloundra, Kawana and Hinterland communities on the Sunshine Coast. The Pacific Lutheran Early Learning Centre is co-located on site. We believe that these principles not only stand as valuable sign posts for the years of schooling but also for life as a whole. 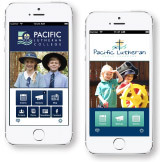 Check out our Pacific Lutheran College iPhone App or the Pacific Early Learning iPhone App today!